Following pressure from haredi parties, Defense Minisrry waives ban on overseas flights for haredim avoiding IDF service. Defense Minister Avigdor Liberman decided to relax regulations requiring those possessing exemptions from military service to receive special permission to travel overseas in order to enable yeshiva students to visit Uman for the high holidays. Under Israeli law, haredi yeshiva students who do not serve in the IDF are forbidden from flying overseas until they are 27 without obtaining approval first from the Defense Ministry. 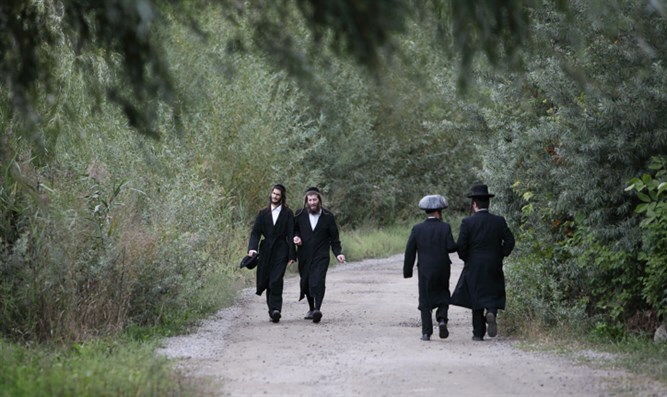 These regulations put a burden on haredim who wished to spend the Rosh Hashana holiday in Uman. According to Kikar Hashabbat, Defense Minister Avigdor Liberman acceded to Interior Minister Aryeh Deri's request for a rule change after the Shas leader made it clear that he was not seeking a sweeping change in the guidelines. I will ask you to order the military authorities to permit exceptions to those who leave for Rosh Hashana prayers in Uman to leave the country for up to ten days without harming their status vis-a-vis the military authorities," wrote Deri. "This request is for this individual purpose and should not be discarded as a broad projection of the sweeping change in procedures."